In 1986, My friend Alan and I managed to get 30-day vacations (we both worked for the same firm at that time), along with permission for international travel (why we needed that is another story). 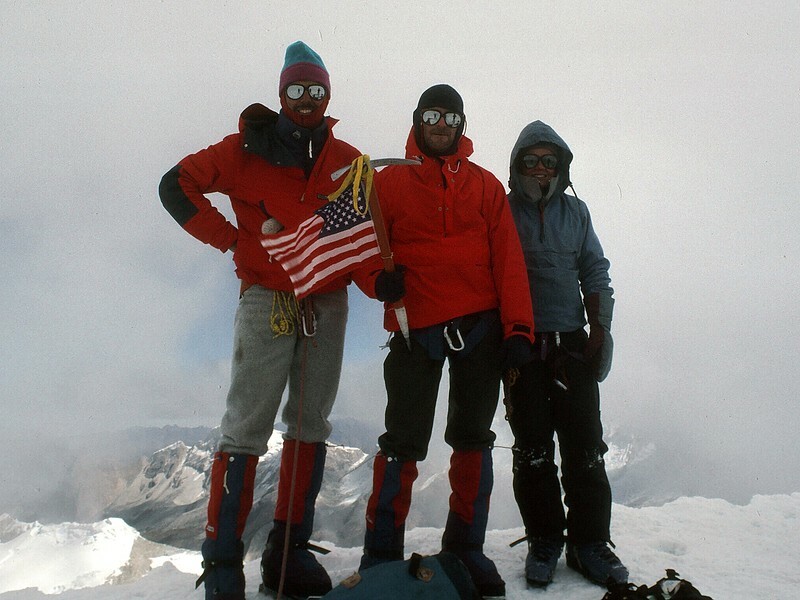 We signed on with the American Alpine Institute (AAI – still going strong) for a climb of Huascarán Sur (6,768 m / 22,205 ft), the highest point in Peru and the fourth highest mountain in the Western Hemisphere. 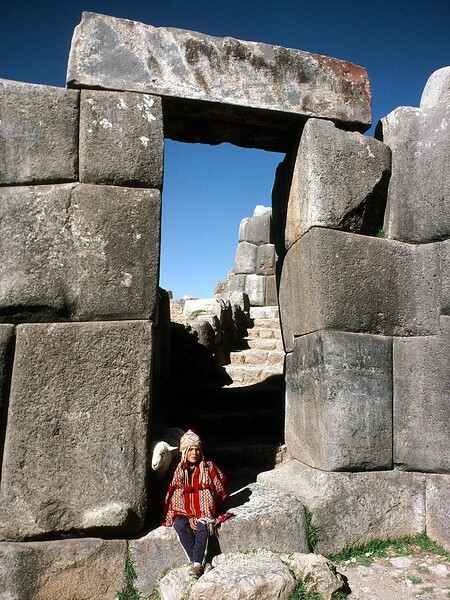 As part of the acclimatization process, we spent a week in Cusco (3,400 m / 11,200 ft), exploring the town, wondering at the amazing stone structures at Saksaywaman, and visiting Machu Picchu, where we found the tour bus drivers on strike. So we climbed a steep trail to the main ruins and then a staggeringly steep Inca stone staircase to the summit of Huayna Picchu (2,693 m / 8,835 ft). 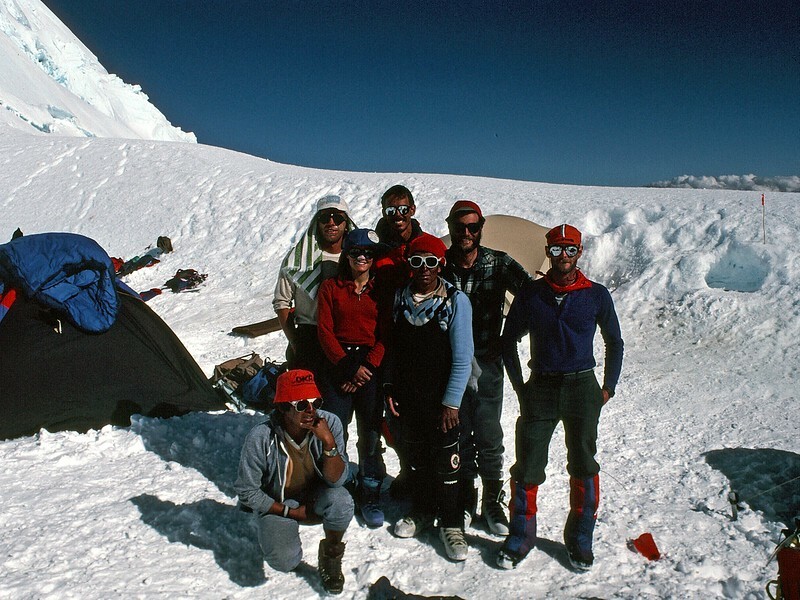 Then it was off to Huaraz in the Cordillera Blanca, where we met up with our AAI guide, Kitty Calhoun, who was just beginning her rise to prominence as one of the most accomplished alpinists of her generation. 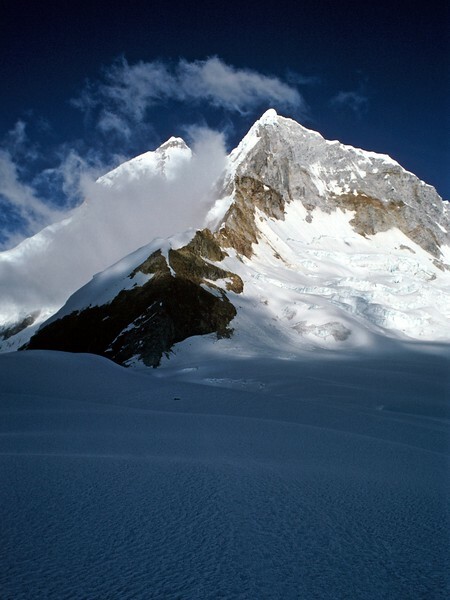 Nevado Pisco Oeste (5,760 m / 18,871 ft) was then, and still is, considered a “warm-up” climb for Huascarán and for further acclimatization. 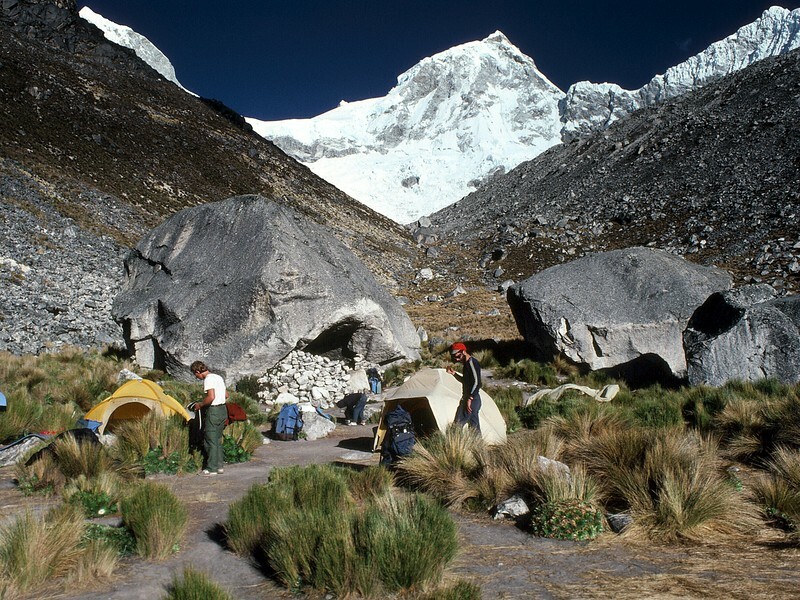 So, from Huaraz, we went up to Cebollapampa (3,850 m / 12,600 ft) near the head of the Llanganuco Valley and camped. 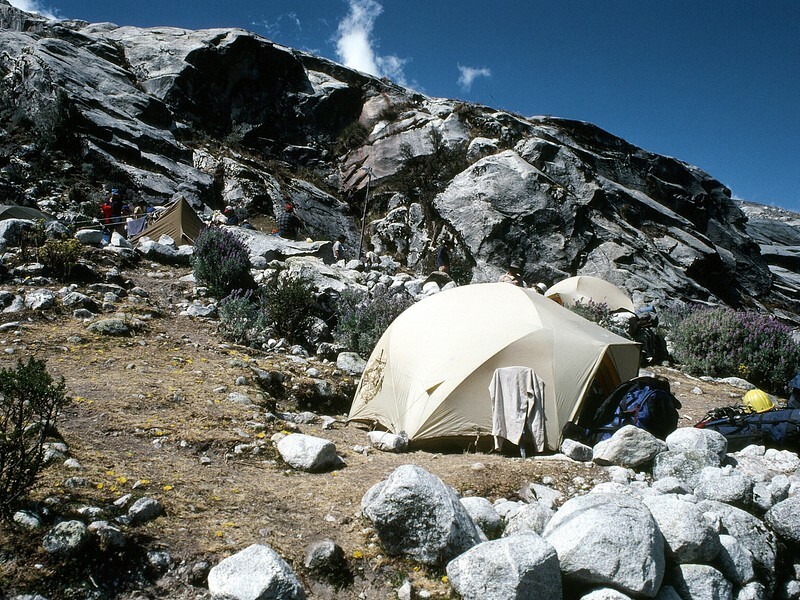 Then we hiked (with a pack animal assist) to Base Camp (4,600 m / 15,909 ft) and camped among grasses and huge boulders. 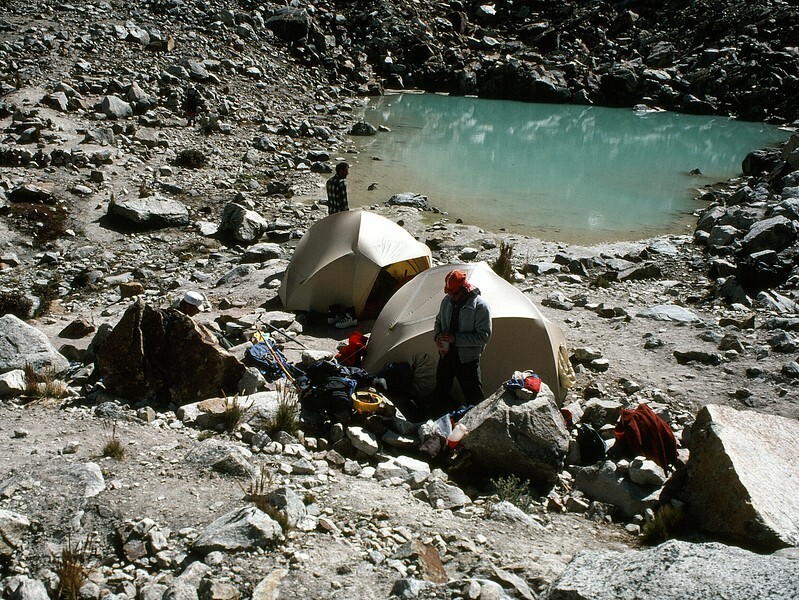 Our next move, carrying our own packs, was to the smaller upper lake at Moraine Camp (4,900 m /16,070 ft). 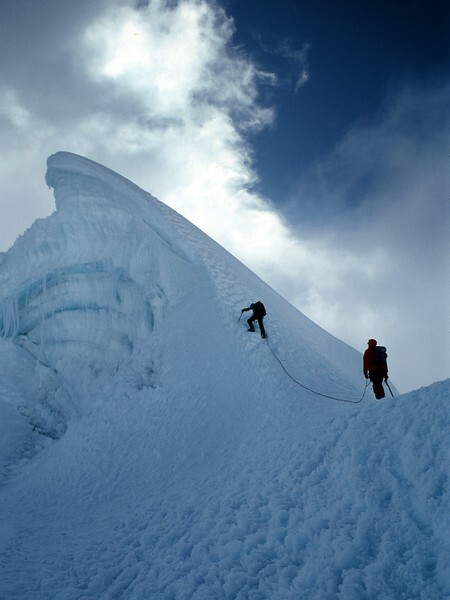 Early the next morning we made the almost 1,000 m (3,300 ft) climb to Pisco’s summit. 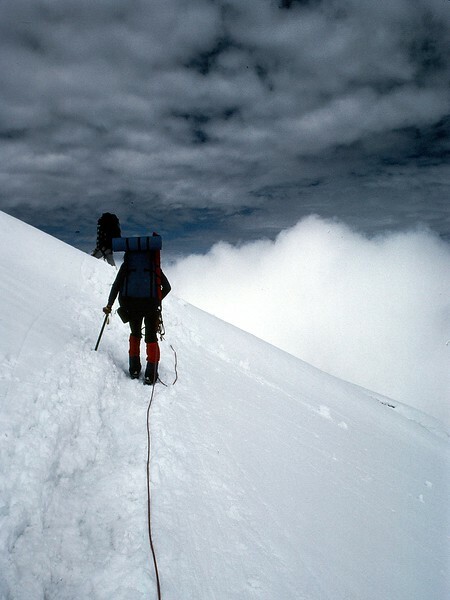 During the ascent we got, after sunrise, some of the famous views of the Andes but, frustratingly, the summit itself was mostly smothered by clouds. 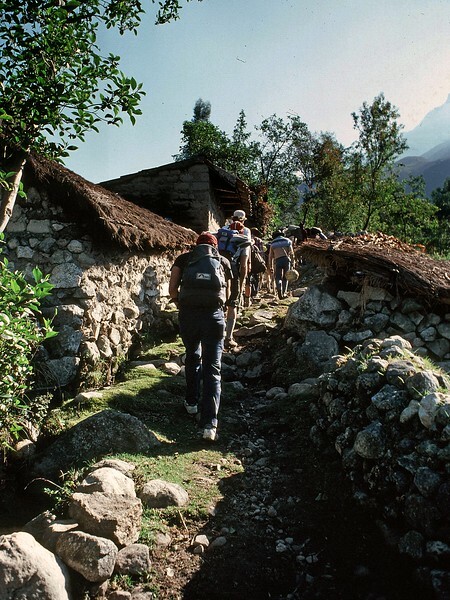 From Pisco, we descended quickly to the valley, resupplied, and then got a ride to the town of Musho. 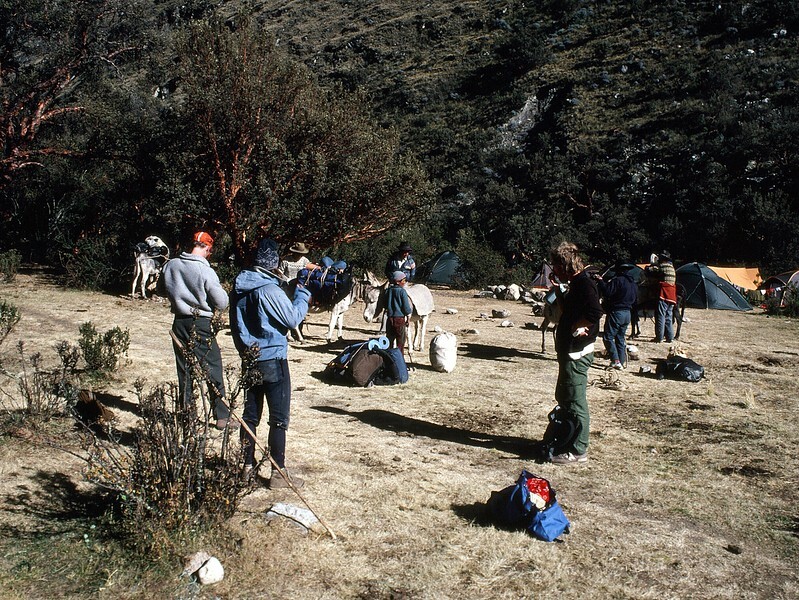 From there, pack animals again supported our hike to a base camp below the snow line at 4,390 m (14,400 ft). 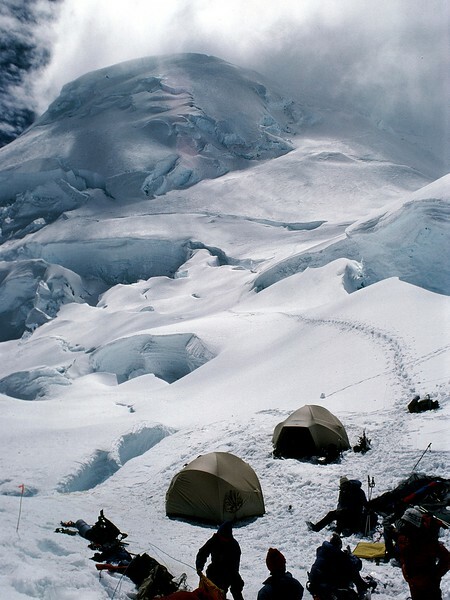 We then packed up to Camp I at 4,760 m (15,600), where – despite the Andes reputation for milder weather – we were pinned down by a snow storm for two days. 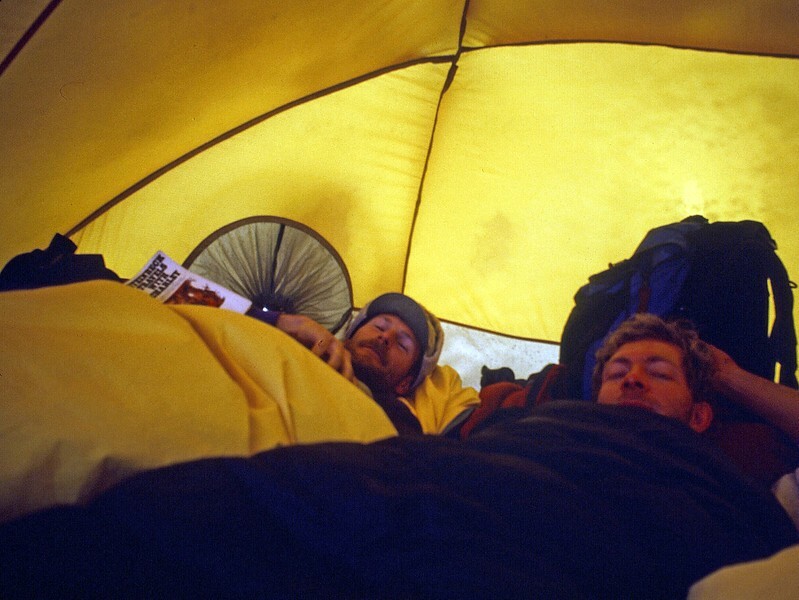 Three of us were sharing a tent but had only one paperback book (Steinbeck’s Travels with Charlie) among us. So we tore it into three pieces and planned to trade the pieces around so we’d all have something to read. Unfortunately, the middle piece drifted under one of the sleeping pads and became unreadable pulp – so I only know how this story starts and ends. 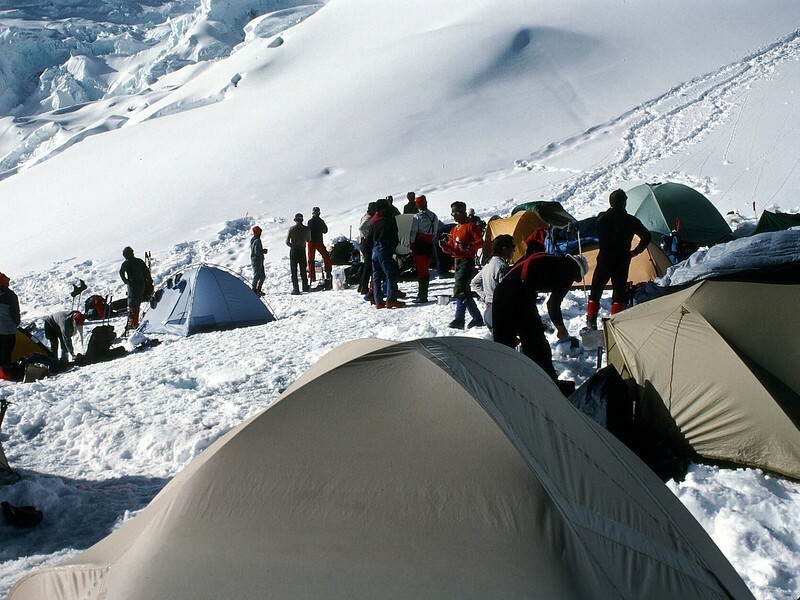 The weather finally cleared and we were able to continue up easy ice slopes and crevasse fields to Camp II at 5,480 m (18,000 ft). 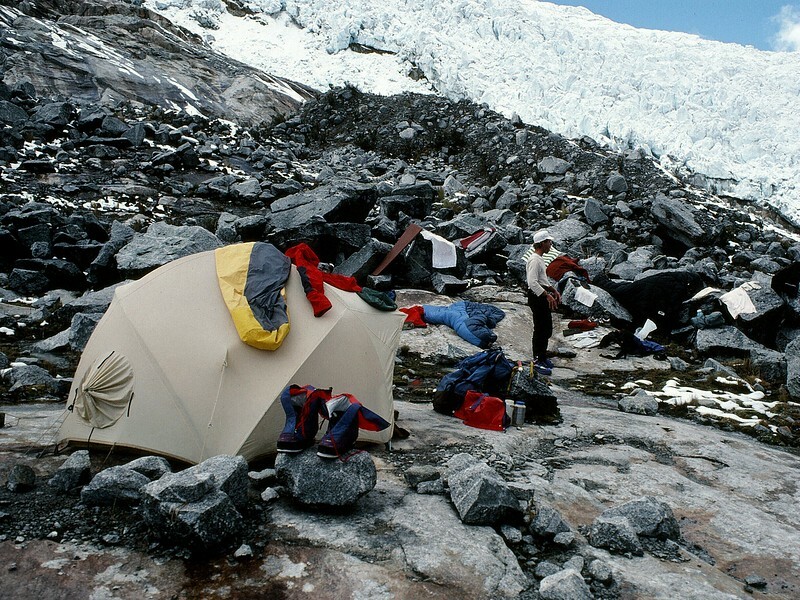 Huascarán was (and is) a popular international climb and at Camp II we ran into teams from several other countries including some from France, Belgium, and Austria. The only sponsorship the Belgian team could get was from a tennis clothing company, so they had us taking pictures of them posing in tennis shorts and shirts at 5,480 m on a snow field! 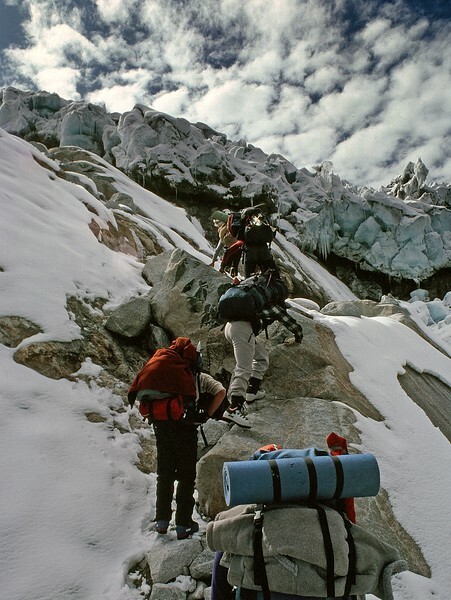 After that marketing moment, we climbed moderate ice slopes and short steep sections to reach Camp III (5970 m / 19,600 ft) in the shelter of a bergschrund above the icefall. Here again, a busy camp with teams from several different countries (but no tennis shorts). 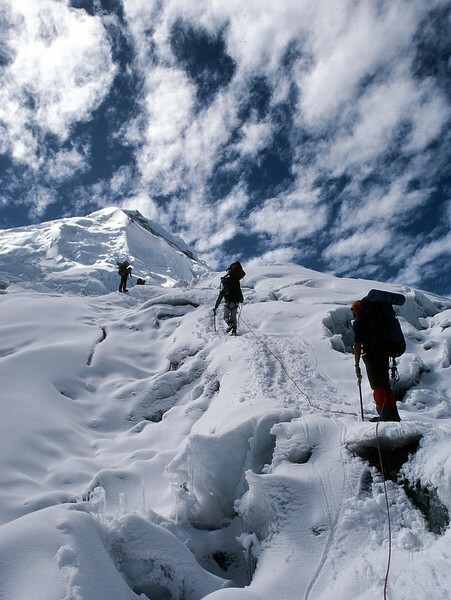 At almost 6,000 m, both our appetites and energy levels were low and it was hard staying warm enough for sleep. All of our stoves save one were being cranky, so meals came down to mostly crackers and almost hardboiled eggs – my appetite for eggs never fully recovered from these culinary delights. 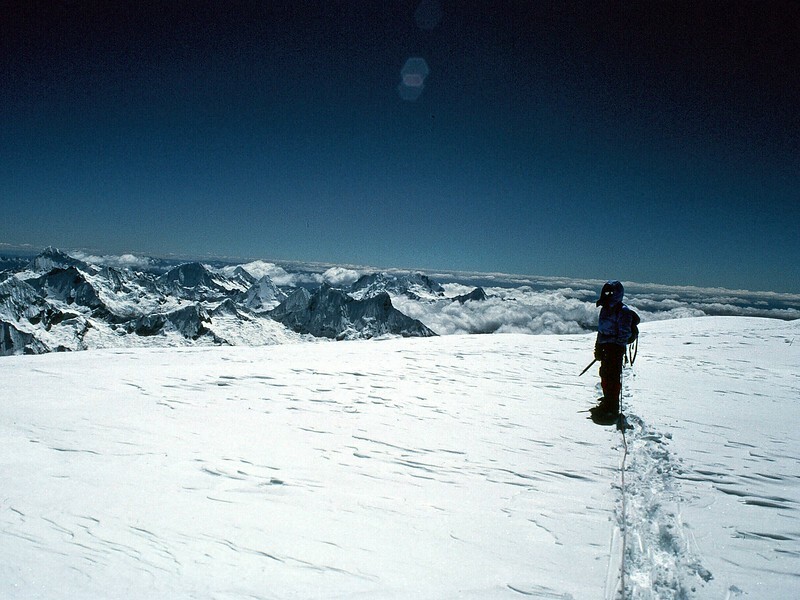 But we’d come this far, so after a day of this suffering, we got a very early start and climbed to the saddle (La Garganta) between the north and south peaks. 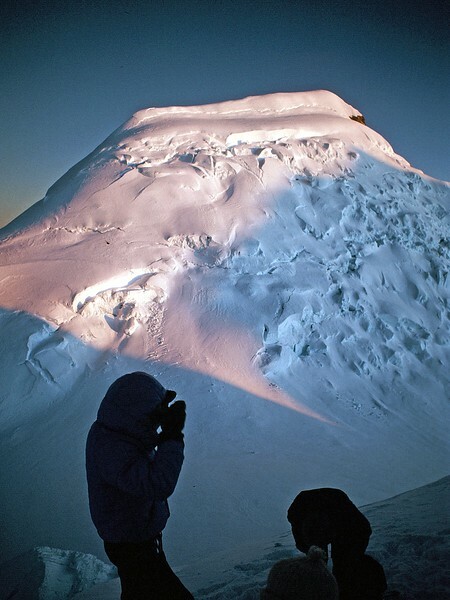 From there, we turned up the steeper 30º-45º north face of the south peak and, after executing a classic pitch on a 45º snow rib, reached the nearly flat summit plateau. 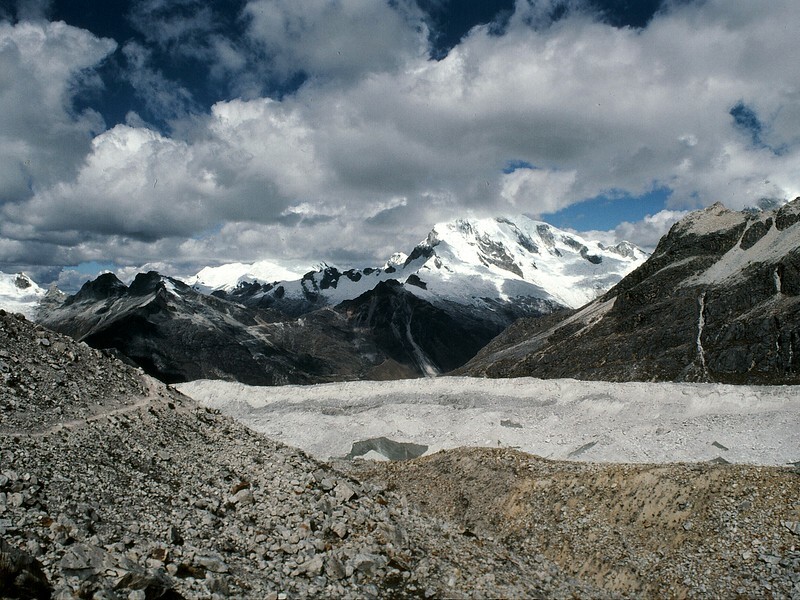 We had absolutely clear skies (unlike on Pisco) and magnificent views of the Cordillera Blanca, the Cordillera Negra, and out over the Amazon Basin to the east. One of my life’s high points to be sure. 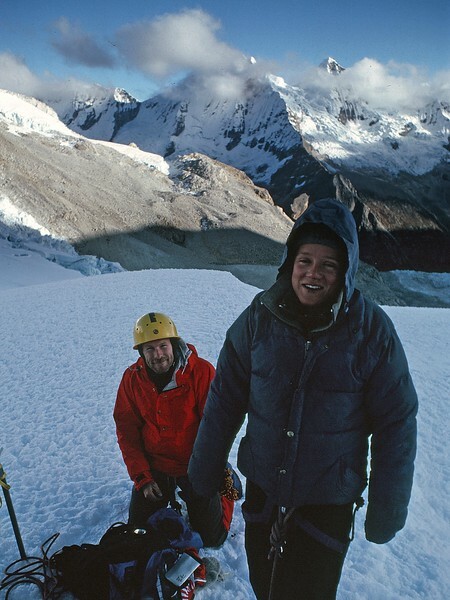 It took us a few days to get off the mountain, get cleaned-up in Huaraz, and then ride a bus back to La Paz. Alan and I got there only to discover that the airline we’d planned to take home was on strike and that we’d need to make other arrangements. So instead of seeing the sights of La Paz, we toured travel agents. One agent offered us a flight home via Moscow (and not the one in Idaho). But since a visit to the then USSR was surely to enflame our then employer’s paranoia about secrets and commies, we had to politely decline. Qué lástima! 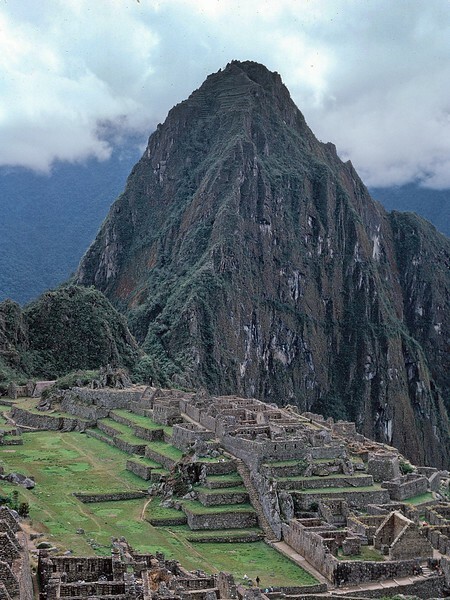 Finally, finally, we got a flight from La Paz to the Cayman Islands (because, at the time, Peruvian airlines were not certified as airworthy for landing in the U.S. – a point we both remarked on repeatedly as our plane bumped and lumbered its way over the Andes). From the islands, it was on to Miami and then to Los Angeles, having avoided commies the whole way! Qué bueno! 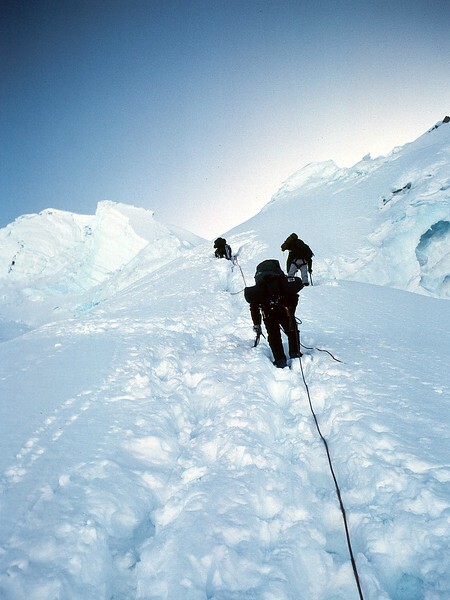 This was the last big climb Alan and I did together and the last time either of us were at these altitudes. 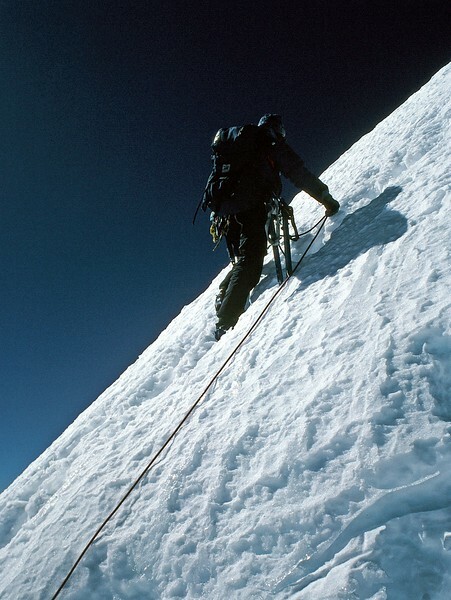 In a few short years, Alan would move on to a wife, kids, and a good (but unloved) job on the East Coast, while I’d stay in the West with The LovedOne and a climbing addiction (not successfully brought under control until 2007) supported by interesting but stressful jobs. 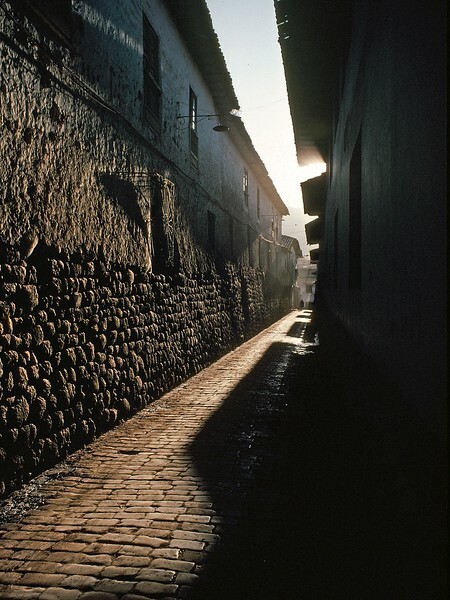 Lots of material things have come and gone in my life since this expedition, but these intangible memories of Huascarán persist, and are much cherished. Thanks! I thought they came out pretty good for scans of 30+ year old slides! Yes, it is. Even in person, the clarity of those jagged peaks against the azure blue sky is hard to grasp. It was definitely a very worthwhile once-in-a-lifetime trip!